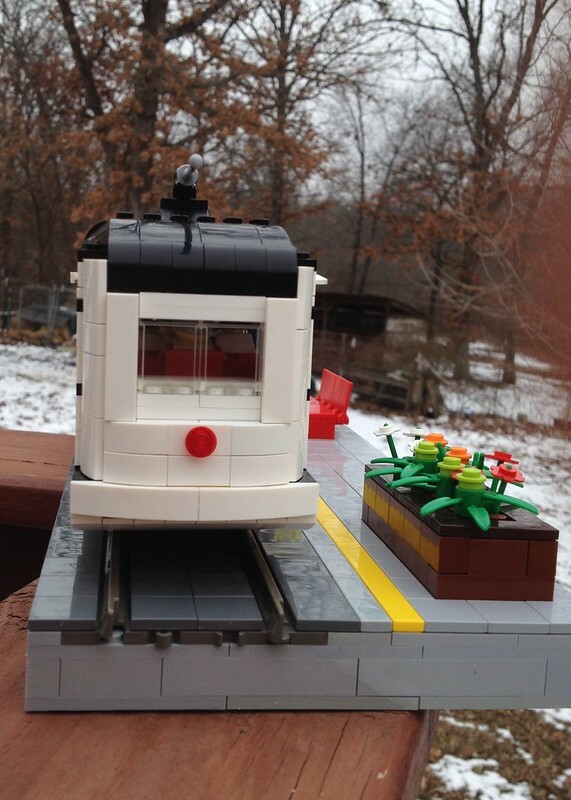 I had built a generic European Streetcar/Tram that I posted here and had then been shown images of a local (to me at least) Streetcar used in Kansas City. Once I saw it I knew I had to build it. 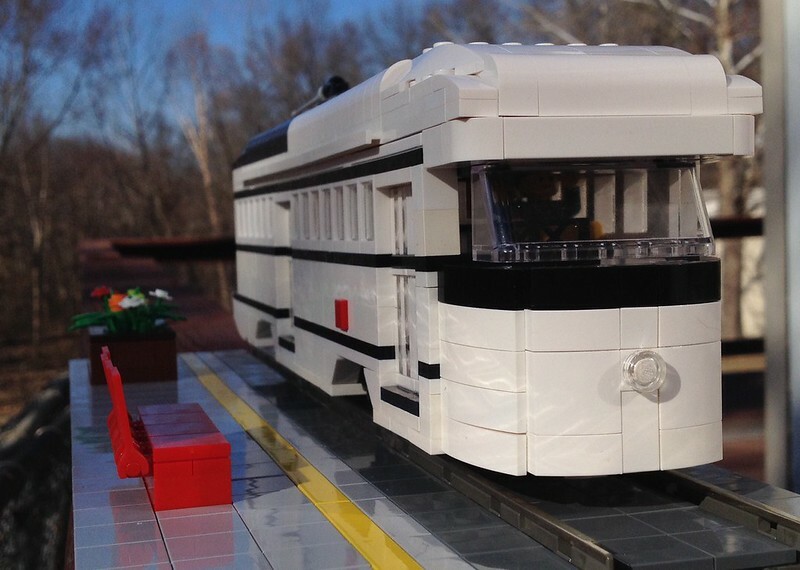 This is an 8-wide, 48 stud long recreation of that Streetcar. The were a number of different paint schemes used in PCC 551's history including one with a black swoosh down the side, but this one is a later version. I used the red tile on a headlight brick to represent the KC Public Service logo which is the Scout image. The windows are 'authentic'. Apparently the head of the KC Public Services department decided that the traditional split windows that normally come with the PCC looked old fashioned so he commissioned the new single pane approach. Here's an image of the doors - they're inset half a stud using jumper plates and made up of a combination of SNOT plates and tiles, L-shaped plates and Darth Maul's Light Sabers! Of course there's an interior! 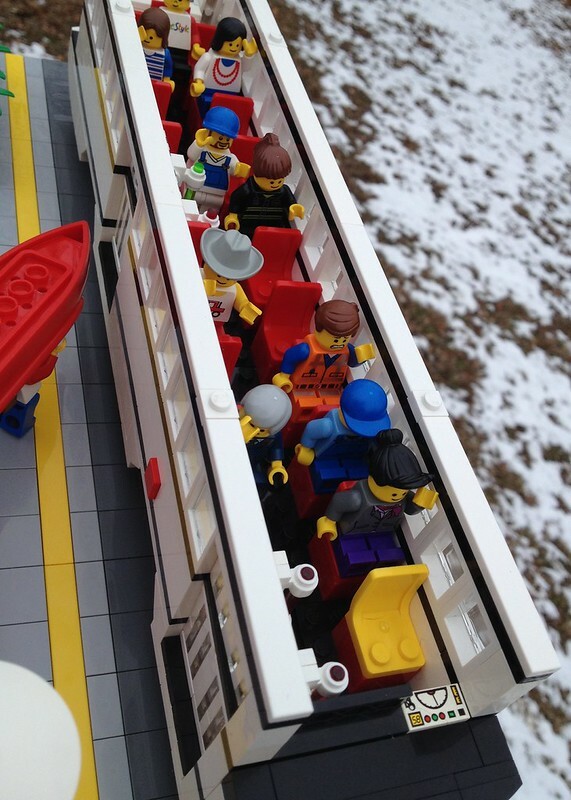 With seating for 19 Passengers and standing room for a further 11. And one final shot of the Streetcar with a couple of passenger's who probably won't get it. Comments, criticism and ridicule most welcome! Bloody MARVELOUS!!!! Love the kayak dudes! !, ha ha. Well, well. I see the hipsters have unloaded their Land Rover and are trying to get their outdoor gear onto the streetcar. 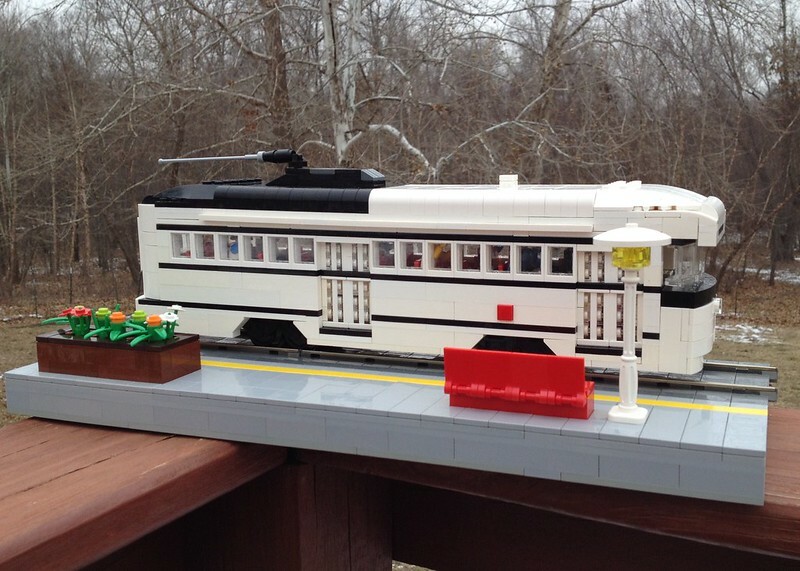 I don't think the streetcar will get them to the white water down in the Ozarks. Seriously, that's a seriously great build. Wanna sell it? I'll thow in a cappuccino machine and some Maroon 5 CDs. Fabulous. 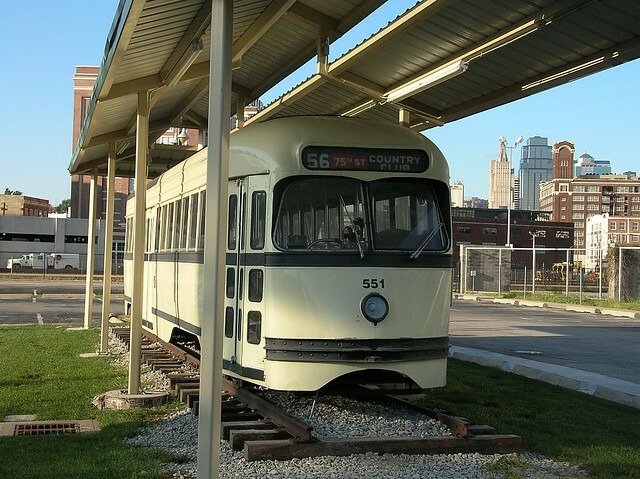 I used to ride those PCC streetcars to school and back. AWESOME 'eurotrash'......side view of it is beautiful and I wonder where one stores a canoe on a tram ? 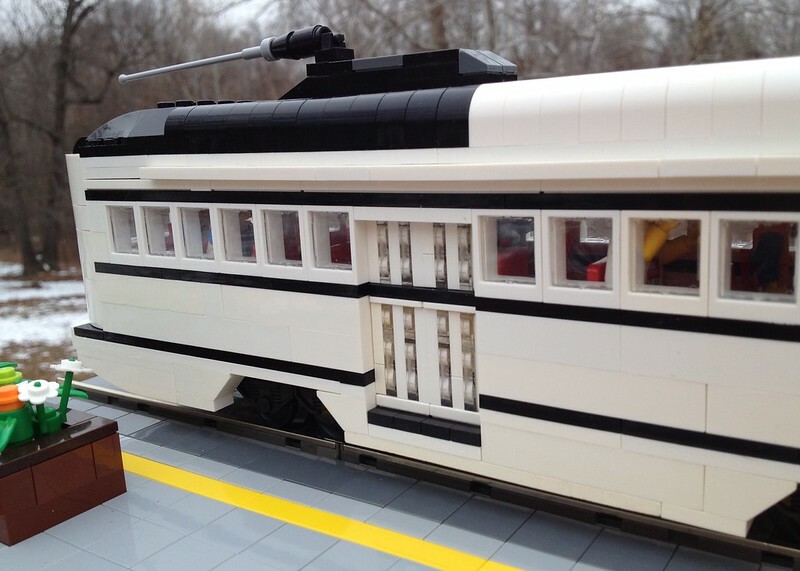 Nice work, PCC's are REALLY hard to do well in lego at this scale. Here's a little more info on a non KC PCC dressed up in KC paint and some background on the actual KC PCC that you modeled. And started building and rebuilding. The front went through three major versions before I worked on closing the various brick gaps, the rear went through more. The roofline was changed at the last minute as my last BL order was opened. In the meantime as I dove deeper and deeper into the rabbit hole I ended up with youtube home movies from the 50's. 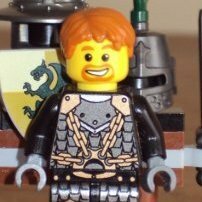 I think it's as accurate as I can get it be given the restrictions that Lego places on you and my skill level. 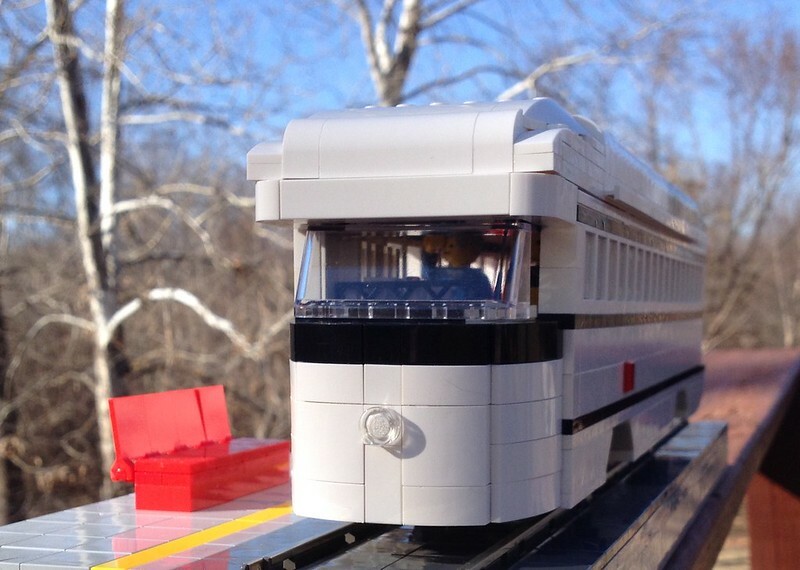 It's been a fantastic building experience - I've discovered a bunch of new techniques and I've also learned a lot about US Streetcars. All, as a result from a passing comment by a LUG Group member. Someone in my LUG was recently talking about the difficulties of building a Lego PCC, and I can see what he's getting at. I like the tail and the doors, but the front seems a little flat. Specifically I think you're missing some of the tapering that happens before the windshield... it seems to me that the front and back surfaces should be more of a 7 or 6 wide when the body is an 8. 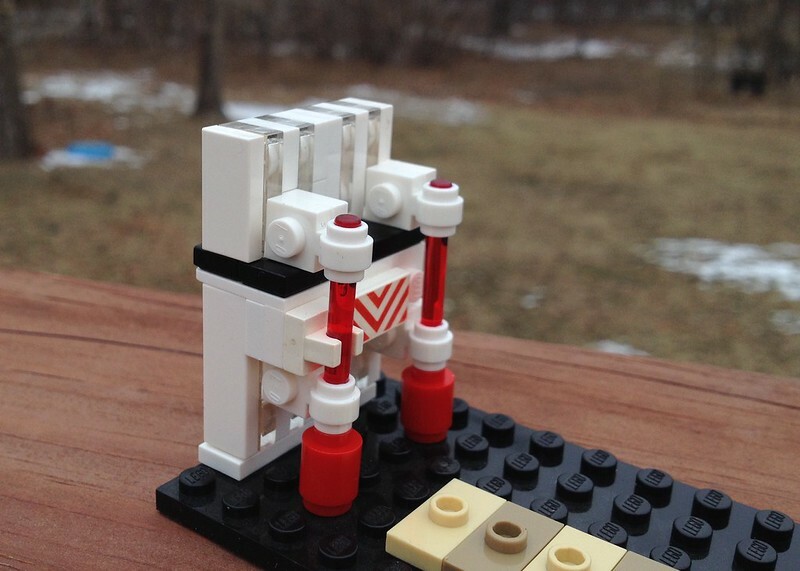 Good effort on a tough prototype, though. Tell Emmet the driver is in the union and he's on break. Not to worry, the emergency brake is on and the driver will return shortly. You're right on that tapering. It does need to come in more before the major curves at the front. I've got a multicolored 7-wide prototype of the front on the bench at the moment, but getting that 6-wide arch underneath is proving tricky. I'll post again when I've got it more dialed in. Actually the PCCs I rode to school were green. They had the "T" inside a white circle for MBTA. Toronto still runs its PCC on special occasions I think. I enjoy looking at them but not so much riding them. They aren't as comfortable as modern air conditioned streetcars. 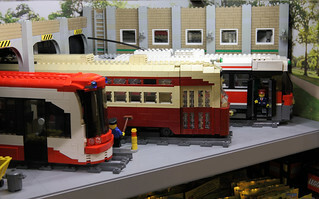 A couple of our LUG members built these for the LEGO Store Community window display. 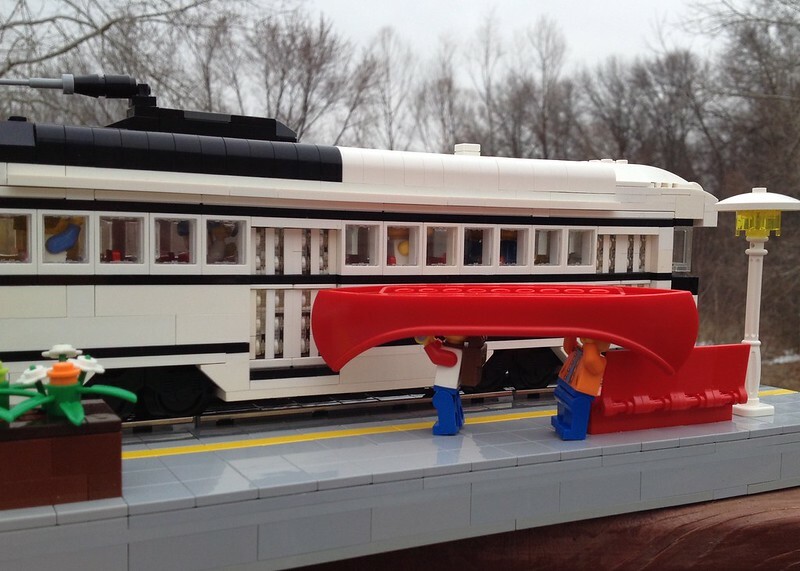 Another great MOC eurotrash ...I like also the baseplate you've done and the red bench! Nice moc Eurotrash, i like it so much. 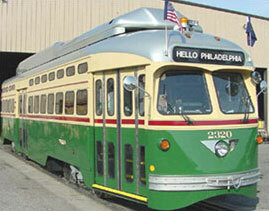 FWIW.... Philly runs PCC-II's on the Girard Line in the city. Very nice. It reminds me of the historic trains running along the Embarcadero in San Francisco. SanFran uses original PCC's along the Embacadero. I did a double take when the first one I saw was 1055 painted in the Philly livery complete with PTC logo. Thanks for all the comments and feedback. I've had a chance to rework the front end to try and recreate the tapering in the original. Once you start looking for PCC's you see them everywhere! The new nose design looks good! 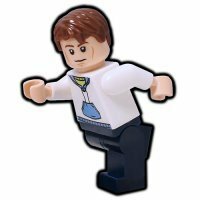 Though are you using the extra small wheels (Like so: http://www.bricklink.com/catalogItem.asp?P=50254 ) or the slightly larger ones: http://www.bricklink.com/catalogItem.asp?P=55423c01 ? 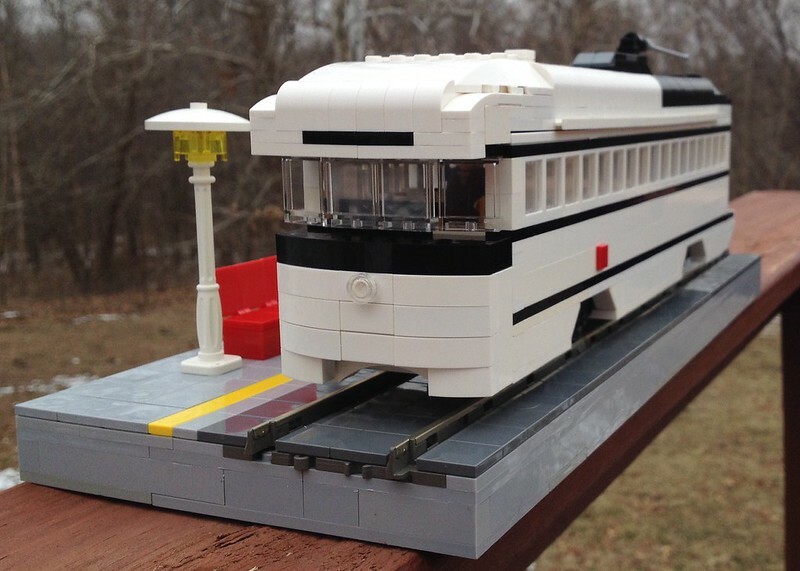 I have the extra small ones on my 7 wide streetcars, and I can't run them due to the squeaking!